I have some adhesive (I think) left on my truck hood. This was holding down a bug deflector so it was 2 sided tape. On the left in the pictures is about as good as I can get the adhesive removed. On the right, I haven't even started yet. My process is heating the adhesive with a hair dryer (it was 40 degrees outside today, but I parked the black truck directly in the sun, and the hood was getting hot), then I tried WD40. After that didn't work, I heated it up again, then tried goo gone and a plastic razor blade scraper. On the left now, when I run the plastic razor blade over it, it feels like there is nothing there. However when I run my thumb over it, it feels a little "sticky" or "uneven". I'm worried the paint has been damaged from the tape. 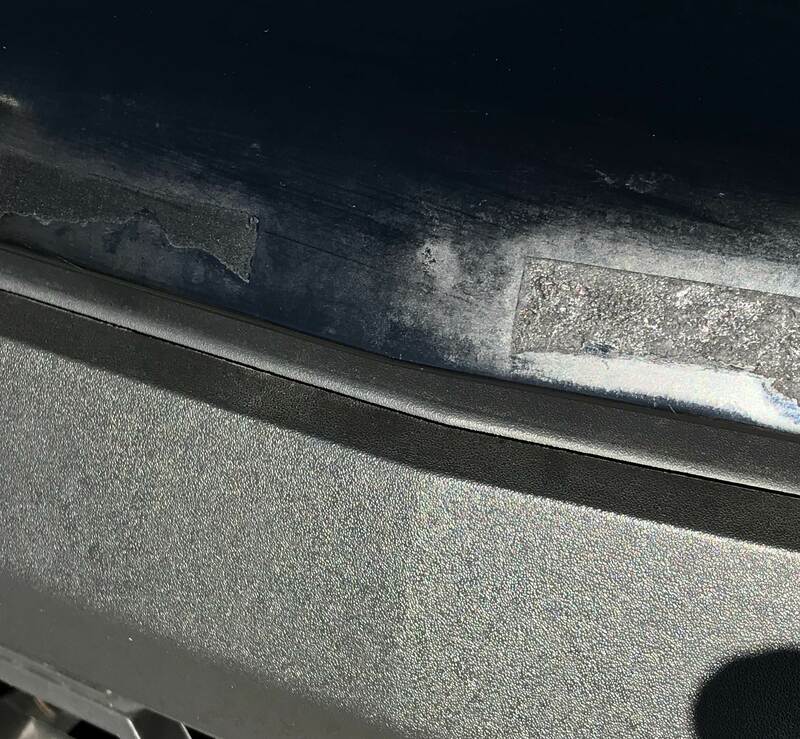 Can you guys think of anything else I can do to get all of this to come off, or repair the issue if the paint has been damaged, without repainting? When I've had to deal with 'sticky stuff' I start with the most gentle solvent I have and dab at one SMALL area with a "Q-Tip." By gentle I am referring something like rubbing alcohol then stepping up to hotter stuff. Yes it does. What would be hotter stuff than WD40 or Goo Gone? I have used varsol (household paint thinner) to remove road tar. It might work on the glue, doesn't hurt the clearcoat, and wax the area after you are finished. Think along the lines of (in no particular order): denatured alcohol>paint thinner>kerosene>lacquer thinner>acetone>commercial adhesive remover. Ya wanna find something that will soften the glue so you can GENTLY scrape it off ( soft popsicle stick works good). This is why I say using a Q-Tip to see what will work. Even give a strong household cleaner a shot. Just keep rubbing the surface to a minimum-you don't want to install any unnecessary marring. My thoughts: Don't be in a hurry to get that stuff off, just take your time. I know it can be frustrating, just keep at it. #9! Who whoulda thunk it? 3M Adhesive Remover https://www.3m.com/3M/en_US/company-...3194120&rt=rud Also available in quart cans. Great for road tar removal too. Be sure to follow directions. Been using the stuff for years. Quickest method is an eraser wheel attached to a drill. More commonly used to remove pinstripes, it'll pull the adhesive right off the paint. There are plenty of video examples on YouTube to give you an idea. Some light polishing on the paint will likely be necessary after you've removed the gunk. NXT looks so good and carefree, I'm left with nothing left to do but drive!